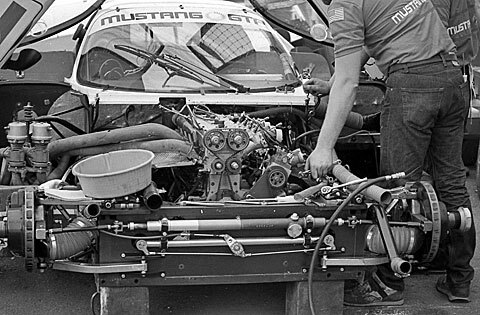 #Focus – IMSA GTP & The Ford Mustang GTP. – Historic Motor Sport Central. 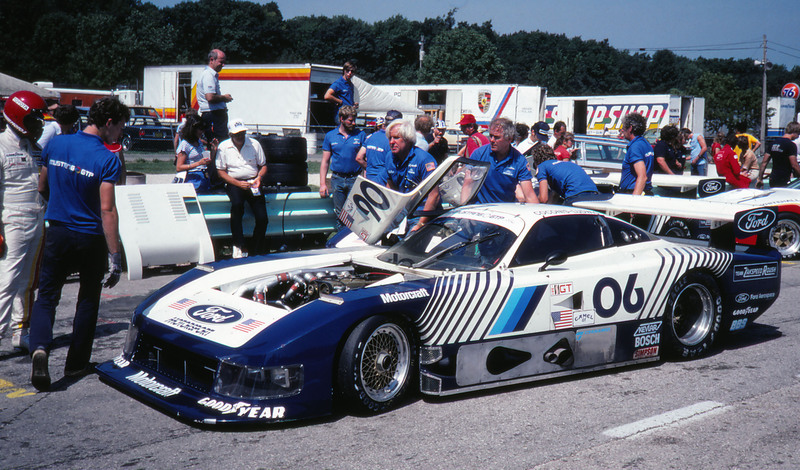 #Focus – IMSA GTP & The Ford Mustang GTP. In 1983, the GTX class of the IMSA GT Championship became obsolete, and was replaced by the IMSA GTP category. 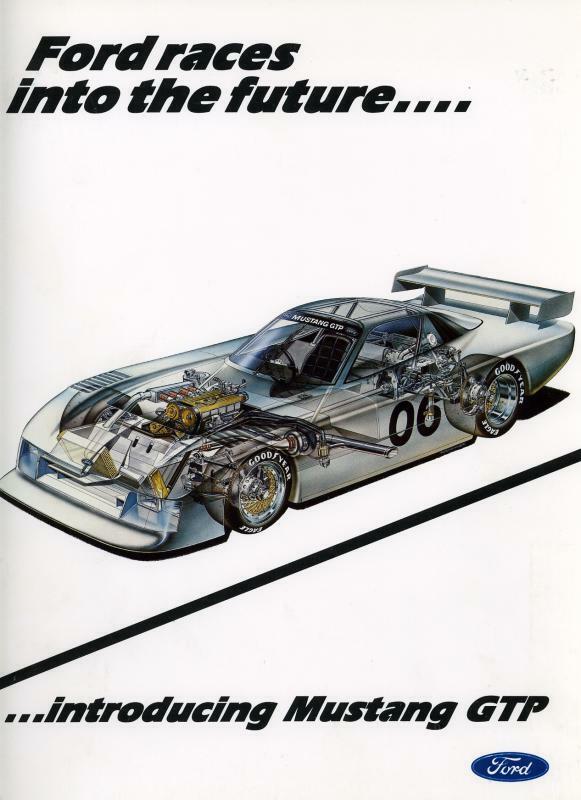 Ford which had been racing the Ford Mustang GTX needed a new car and here comes the story of the Ford Mustang GTP. Unusual was it’s design and the fact that they would produce a front engined car which at the time was already obsolete compared to the cars it would race against. 1983 – Ford Mustang GTP. Bob Riley was the man chosen for the design of the car, one of the man behind the Saturn Rocket project and the Coyote Indy-winning program of A.J. Foyt. The idea was that with a front engined car, it would give an opportunity to maximise downforce. No engine at the back so the venturis could be as big as possible. Another funny thing is that Ford wanted the car to sport some of the production designs but in the end, nothing on the race car could be compared with the production one. The chassis was originally designed and meant to be build out of aluminium honeycomb, a common thing back in the days in sportscar racing. However, with advances in composite, Ford decided to build the chassis out of carbon fibre. Hercules was approached for the work as they were one of the leading company in the sector with McLaren F1 and the MP4 serie but it would prove difficult for them with Ford’s schedule. Ford decided to work with its aerospace division which at the time was very much linked to the NASA for the satellites. It proved complicated but they did it and Protofab would carry the assembly of the car and bodywork. The engine would be the 2.1-litre straight four turbocharged Cosworth BDA for a planned 600HP sent from Ford Europe and Zakspeed which would in fact run the car through its Zakspeed/Roush team. The final car would weight around 800 kg and 3 of them were built as part of the program. The engine bay and chassis front-end. The engine was the problem, sourced from Ford Europe it was successful over there but not for the long distance races in America and it wasn’t the only problem. Turbocharging meant heat, and that was hard to handle with a front engined car and tub made of carbon fibre. The development budget wasn’t there to make it reliable and both Zakspeed and Roush were concerned. One of the three chassis was secretly converted for a V8 stock engine to be put in by Roush but that never took the track as Zakowski from Zakspeed asked Ford to put an end to it..! The Zakspeed BDA would be the only engine for the car and Roush parted with Zakspeed and went on to win the TransAm with Protofab the following year. 1984 finally saw the 2.1-litre Turbo BDA introduced but the season was marked by DNFs. The car did work but not long enough. It was difficult to drive as well as it had no power-steering but front engine and high downforce. But in the end, the problem simply was the engine and also that at the time Zakspeed was running the same type of engine in F1 so their eyes were not 100% on making this one working..! This is true as I recall it. At the time I worked at Ford development for Bob Negstad of Cobra 427 fame, who was close to Bob Riley, SVO, Roush, and PPG Pace Car, but sort of a black sheep in FoMoCo itself. Corporate Politics interfered with decisions on concept, components to use, etc. such that the proper car, which might have still looked like this one was never allowed to develop. The crappy ho hum mid engined V8 that came afterward as a slap in the face was more successful, somewhat. Previous Previous post: #Tech – Polimotor or Plastic and Racing Engine. Next Next post: #Focus – IMSA GTP & The 1988 Jaguar XJR-9.